Heel vs. Heal – What’s the Difference? Home » Heel vs. Heal – What’s the Difference? Heal and heel are homophones. That means that they are pronounced the same when spoken aloud, but they don’t mean the same thing. Homophones are confusing for many writers, and heal and heel doubly so, since they can both be used as a verb in sentences. Even though they are homophones, the words heal and heel are never interchangeable. It is, therefore, important to remember the meanings of these words, since even simple typos can distract your audience and derail your credibility in academic and professional writing. What is the Difference Between Heel and Heal? In this post, I will compare heel vs heal. I will use each of these words in an example sentence, so you can see them in context. Plus, I will show you a memory tool that you can use to choose heal or heel in your own writing. What does heel mean? Heel is usually a noun, where it refers to the back part of the foot. Humans have one heel on each foot. The word becomes heels when plural. Heels can also refer to shoes that are elevated in the back to make someone look taller. Achilles used to be a warrior like you, until he took an arrow to the heel. “I have been walking in these heels all day, and I just want to sit down and have some food,” complained Riley. Heel has a secondary meaning as a noun: a nasty or annoying person. The neighbor is a heel of a woman. She yells at everyone. Sometimes, heel is used as a verb, chiefly when commanding an animal to follow closely behind its owner. What does heal mean? Heal is a verb. It means to repair an injury. Heal can be transitive or intransitive. In other words, a person can heal, or a person can heal someone else. The ointment healed me scab. When used as an intransitive verb, heal is often reflexive. In this case, it is used with a reflexive pronoun. Ellie’s dermatologist healed her skin disease, which was very rare and poorly understood. Heal is a regular verb, so it is conjugated according to the same rules as many other English verbs. It is heal in the first and second person singular and plural present tenses, as well as the third-person plural present tense. Its third-person singular present tense form is heals. It becomes healed in the simple past tense, and healing as a present participle. 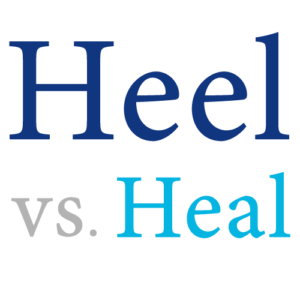 Now, lets go over a trick to remember heal vs. heel. Being homophones, heel and heal are easy to confuse. They can both be used as verbs, which doesn’t help either. Only heel is used as a noun though. Since it contains a double E, like the word feet, remembering that heels are found on feet is a simple proposition. Also, you can remember that heal has to do with health since it starts with the same four letters. Is it heel or heal? Heal and heel are homophones. Both of them can be used as verbs, but only heel is also a noun. Heels are the back part of feet. Heel is also a command given to an animal. To heal is to fix an injury. 1 What is the Difference Between Heel and Heal? Accidently or Accidentally – Which is Correct? Incase or In Case – What’s the Difference?